And let me make it clear, this may be a valid argument, but with one large caveat. While cinema doesn’t need to be anything more, it’s evident across the spectrum of genre and since the art form’s birth, that there is indeed something more. Whether we want to acknowledge it or not, humans do not act randomly, we are creatures defined by our past and our views, rational or otherwise of the future. If that’s the case, we should immediately dispose of the idea that what we create ('creation' being the result of non random action) has insightful and critical meaning to our existence. Pollock's 'Autumn Rhythm' continues to resonate with audiences, despite it's seemingly random composition. Little Red Riding Hood was a story created and told for children, but it wasn’t just a story meant to entertain. It was a story created at least partially as a warning for children. Hansel and Gretel’s actions weren’t that of convenient storytelling—they’re tied to dramatic, important historical context. Their actions give us insight into what life was truly like when the stories were first told. And because of that intrinsic tradition of human storytelling, we should immediately dispense with the idea that our stories are exclusively entertainment. If we accept this (and the point of this entire blog is to convince you of that) our perceptions of virtually every detail of story, no matter how trivial, become utterly important. We’re no longer passively enjoying a story; we’re relating, we’re empathizing and at the end of the day we are learning something about ourselves. Something so deeply ingrained that we often can’t even see it. I anticipate a cynical reaction to my analysis of Toy Story. You might think that I’m being disingenuous to suggest that something worth discussing happens in the film. But it couldn’t be more to the contrary. As we grow older, the films that we cherished as children resonate more powerfully than they did when we first watched them. Think back to the fireside stories and warnings of Hansel and Gretel and Little Red Riding Hood. From this standpoint, dissecting the most base and most unassuming of cinema’s cultural contributions (the contributions to our children) we can see the art form most clearly and can identify the truth that film is more than aesthetic. Toy Story is a film that wears it’s premise on it’s sleeve. It’s filled with gags about, “toys that talk.” Not only do these toys talk, they make pretty humorous references (ala Joss Whedon, a co-writer). After the opening sequence, we’re left with a clear understanding that it’s not just that these toys talk. They have a uniquely human consciousness. One where they define themselves by those around them and by the views they hold of themselves. Rex on the other hand is a dinosaur but struggles with the fact that he doesn’t fit the mold. He attempts to scare Woody by surprising him and roaring as well as he can. Woody is un-phased. And this, is truly what is striking about Toy Story—that these characters not only talk, but understand their place and struggle in some of the same ways that we do. They ask similar questions. The widest of these questions being, “What am I?” and, “What is my purpose?” And from this perspective we see their struggle is quite dramatic. Andy’s Room functions as it’s own little slice of reality and Woody is the one who holds power and sway over the group. He leads the meetings and is the one that gives the orders to the army men to investigate Andy’s birthday party so they can see exactly what toys he gets. They all eagerly wait on the other end of a walkie-talkie for the results. All is well until one last, secret present is revealed. It turns out to be Buzz Lightyear, and from there the film finds it’s rhythm and main conflict. Jean-Paul Sartre is who we could consider the ultimate existentialist. Not only did he title the movement but he contributed some of the most important ethics (he would hate that I called them ethics) to the movement itself. Existentialist thought focuses purely on what is in front of us—it focuses on who we are. And while that premise might seem simple upon first interrogation (I AM Bret Hoy. I AM writing) what we find is that how we define ourselves isn’t always the most accurate. The phrase, “you know me better than I know myself” isn’t just repeated out of some ambiguous meaning. For some, this is a literal reality. Someone might actually know you better than you know yourself. And clearly, that presents a variety of issues for the, “self.” Who are we actually? Sartre never backed down from the uncomfortable realities of this question, and his answer is captured in one of the more powerful sections of his book, “Being and Nothingness.” That is the complex relationship between what Sartre labels, Facticity and Transcendence. It would be false for us to say that we are purely who we think we are. That is, that our view of ourselves is entirely accurate. And it would equally false to say that we are who people think we are. So who are we? To begin to discuss this, Sartre adopts and uses these words, Facticity and Transcendence. Facticity being a focus on what concrete details we truly can verify. For Woody in Toy Story, this constitutes a large percentage, if not his entire worldview. He is a toy. He is in Andy’s room, and this is the way it is. He’s living to be a toy for Andy, and it’s a defined purpose he almost never sways from. We’ll see this focus dramatically effect his decisions as he loses his purpose and almost dies because of it. What Sartre is getting at here is that we are living as much in the future, in who we think we will be, than as who we actually are. The, “actually” being the facticity. Think, Buzz Lightyear. Buzz is a toy, but that’s not who Buzz says he is. Buzz says that he is a Space Ranger, set on destroying the evil Emperor Zurg. "I am what I am not" Buzz is a space ranger, though he is actually just a toy. "and I am not what I am." Buzz can't be just a toy, because he acts like a space ranger. After his arrival in Andy’s Room, he treats it as if it’s an alien planet, and his mission is based in the future. And most dramatically, this is a false future. One that doesn’t exist. One of the most prominent critiques of the existentialists is that they never provided ethics. They never truly divulged a vision of, “how” to live. Instead, they described what could be considered, “truths” about the world and about how we view ourselves and how we view others. I think this is a salient detail and one that shouldn’t be taken lightly. Sartre’s main premise for existential thought gravitates around the idea that we all take responsibility for who we are, and for how the world is. While his theories on, “Responsibility” don’t really have a place in this essay, what does have a place is that transferral of responsibility. Sartre, for all of his perhaps prideful pronunciations of, “truth” didn’t venture into the world of morality. He left those decisions to us and I think this is for an important purpose. Much like Nietzsche would say, morality is subjective, and can only really be defined by like-minded communities living in a certain moment in time. Toy Story, and the filmmakers behind it are the ones that create the ethics. And Toy Story is just as much influenced by the identity politics of the 80's and 90's in the United States as much as Candidé was influenced by the revolutionary times Voltaire lived in. This isn't to say the two are of equal importance, but that each was influenced by and reflect the era they were created in. 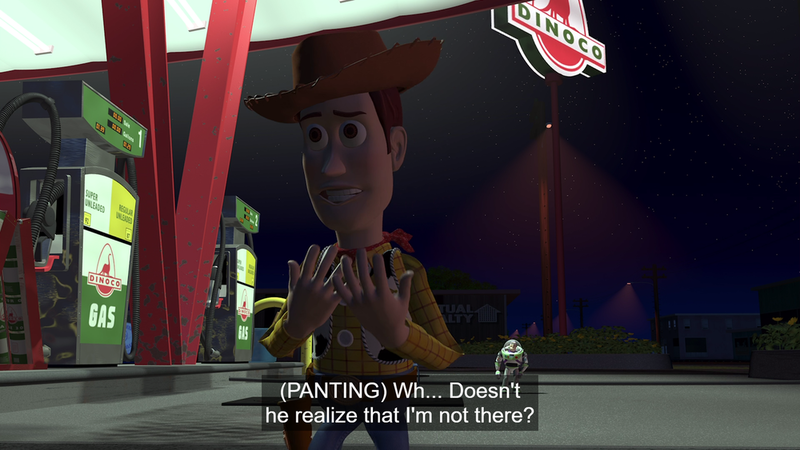 For the first third of the film, we see Woody go from annoyed to actually angry at Buzz’s inability to see himself for what he is. He mocks Buzz openly angry at the idea that he thinks he’s anything but a toy that belongs to Andy. But after a scheme to get back in Andy’s good graces goes awry, both Woody and Buzz find themselves outside of Andy’s room, but pursuing different goals. While in a car at a gas station, Buzz and Woody fight and end up careening out of the car. As their fight continues, Andy and his mother re-enter the car and drive way. Woody is alone. He's a lost toy. And for the first time, Woody is confronted with a reality in which he can’t define himself through his owner. He's a toy, but what for? For Woody, this is the existential crisis that most of us can relate to. What do we do, when our purpose has been taken from us? When we’ve spent so much time thinking of ourselves through the way we function in society and through how others view us, and not the way that we in-fact ARE. But the opposite is true for Buzz. After being left alone, without Andy, Buzz is still on his mission to defeat Zurg. If we are to think of Buzz as similar to us, we’d see him as someone who ignores his reality, and focuses purely on the future. Both Woody’s and Buzz’s worldviews are summarized in their momentary reaction to crisis. As Woody and Buzz watch Andy’s car drive away, an eighteen wheel truck pulls up the gas pump. Buzz, the space ranger darts out of the way, finding safety, but Woody who is to his core just a toy, plays dead. This simple action not only undercuts our view of Woody as the, “Sane” one, but it almost results in his destruction. The tire of the truck rolls closer and only stops after bumping up against Woody’s head. If the truck hadn’t stopped on it’s own, Woody would’ve let himself die. And for what? Because he views himself as a toy, exclusively. An object of a human's sight. When watching Toy Story for the first time, you’re struck by Buzz’s inability to comprehend his status as a toy. As what he eventually calls himself, "a child's plaything." But to identify as one element of yourself, as only that, “facticity” is what very nearly kills Woody. And so after this scene, we see this view of Buzz as, "insane" sharply interrogated. And really, I can’t help but agree with Buzz. But as we all know after watching Toy Story, Buzz does not get away from this scot-free. Buzz is forced to come to terms with his state as a toy when he sees a commercial for Buzz Lightyear action figures. The words, “not a flying toy” flash on the screen and Buzz for the first time truly questions who he is. And this distress, one that cuts to the core of how he personally identifies is so powerful that he doesn’t initially accept it. Randy Newman’s accompanying lyrics tell the story in a profoundly sad way. Buzz Lightyear, steps to the edge of the balcony, and jumps off, hoping he can fly. We however know what happens. He falls. Buzz’s and Woody’s crises both come to a head on the eve of Buzz’s destruction via Rocket, and even with that Rocket strapped to his back, Buzz fails to see the value of his own life. Woody explains to him how much more he is than that. How Andy thinks he’s the coolest toy in the world and how valuable that is. And then Woody has a realization of his own. Woody then says, "I'm the one that should be strapped to that rocket." In the same way that we saw the disadvantages of both of these perspectives earlier in the film, with Woody nearly letting himself die and Buzz almost killing himself by trying to fly, in this moment we see the positive elements of both. We see the value in living, “for-others” and, “for-itself” as Sartre would say. Facticity can be described as the concrete details of life, and as the future contains nothing concrete, living in facticity, like Woody means living in the past. Transcendence is described as living in our self-imposed identities. Saying “I am”, not in the sense that you are ____ in that moment, but that you will be. Living in transcendence means that you are living in the future. And if there is an ethic that the filmmakers want to instill in us it’s that we shouldn’t focus on either, exclusively. That, a reasonable perspective on both is our only real chance at understanding ourselves. When Sartre discussed Facticity and Transcendence, he never meant to define humanity as predisposed towards one or the other. In fact, if you were to ask him, he’d say that we are the culmination of these two things. That is, who we are and who people view us to be. But as much as we want that to give us some sense of conclusion, it is yet again, not that simple. Our thirst for clarity of self often leads us to over-confidence or insecurity. As we look deeply at who we truly are, we find that we can’t say with any sort of certainty who we are. Sartre grappled with this in his play, “No Exit.” In this play, we are confronted with three characters who are in a sort of, "hell." Each character looks back and tries to understand who they were. Joseph Garcin one of the main characters, was a man who lived a famously honorable life as a journalist, but in his personal life he had no respect for his wife and cheated on her. He tries to rationalize these two sides of himself and weigh them against each other—Was he a, “Good” man? Did he do enough to earn that title? This complication is summed up most dramatically in his argument with the play’s other protagonist, Inez. Buzz and Woody provide one of the best portraits of this human dichotomy, and perhaps are even more effective if you think of them as two parts of the same whole. And if facticity is living with your mind on the past, and transcendence is living with your mind on the future, what then are we left with? Who are Woody and Buzz together? Sartre’s Being and Nothingness, didn’t contain an ethic per se, but it did speak a great deal about the ways Sartre viewed our existence. He put immense weight on our own personal responsibility for how we choose to live. Not just in what we do, but what we don’t do. And this responsibility doesn’t paint a picture of a human that is innocent, even in our unconscious, or what he would call, “pre-reflective” decisions. Both Woody and Buzz break out of Sid’s home and chase after the moving van as it drives down a busy suburban road. The only way they’re able to catch up is by using the rocket strapped to Buzz’s back. They’re fired down the street, careening towards the moving van and then up straight into the sky. Buzz responds, “Not today” and extends his plastic wings, ripping the tape and freeing them both from the rocket and saving them from death. They plummet to the ground, but then, miraculously, they swoop towards the sky. The two are together, inexplicably gliding. Buzz holds onto Woody so that he doesn’t fall, and Woody extends out his arms as if he’s flying with Buzz.